I open my eyes and look at the clock. 5:30 a.m.
“Go back to sleep,” I say in the nicest way I can muster. I open my eyes and look at her. She is dressed in her new favorite Pippi Longstocking outfit and is holding the hairbrush and four rubber bands in different colors. “OK,” she says with a sigh. I hear the disappointment, but it’s 5:30 a.m.
Thirty minutes later my alarm goes off and she is standing right next to the bed waiting. She is still holding the hairbrush and rubber bands. I’m sure she did not just stand there for 30 minutes waiting. Right? I’m sure she played or something. I sit up and try to be as pleasant as I can. I spray her hair with detangler, which she had thoughtfully placed next to me in bed. I brush her hair carefully making sure that I don’t pull or hurt her. I use her favorite parting comb, the pink one with the sparkly handle, to gently part her hair into two. I use the pink rubber band on one side and the yellow on the other for pigtails. Then I braid each one. “Blue rubber band on the pink side and red one on the yellow side,” she says. When I’m done she skips off and puts all the brushes and spray away. After dragging myself through my morning ritual of shower, picking out the lest objectionable of my clothes and running a brush through my hair, I head downstairs. My girl has made us all breakfast of cereal, toast and juice. Brother is there and dressed too. I think I might be dreaming. They both smile. “What did you do with my children?” I ask. They giggle and we eat. “Today’s the day,” she says. I pack lunches and do the morning dishes as they pretend that their bouncy balls are pigs. The pig race gets a little out of hand, but we make it out the door on time. The ride to school is filled with talk about the pig race and plans for building a more elaborate race track and making prize ribbons when we get home. I tune in and out as I sip my coffee. We drop brother off and head to her school. I look back at her in the mirror and she is beaming. “What is going on?” I ask her. “You’ll see,” she says again. We pull into the school and she is literally bouncing in her seat. She bolts out of the car, grabs my hand and we head straight for the monkey bars. She has been dreaming of making it across the monkey bars for over a year. It was only in the last week that she started really trying. Every day she would just hang on the first bar and then drop. Over and over and over. She never seemed to get tired of it. We spent hours the previous weekend and several more after school all week with her reaching across a few bars. She could make it about halfway now. After a few attempts, we developed a cheering agreement. I was not allowed to say anything until she dropped. No clapping or encouragement. “It makes me nervous when you say something,” she told me. So I would just watch and nod. When she made it farther than before she would come over and say, “you can cheer now” and I would. 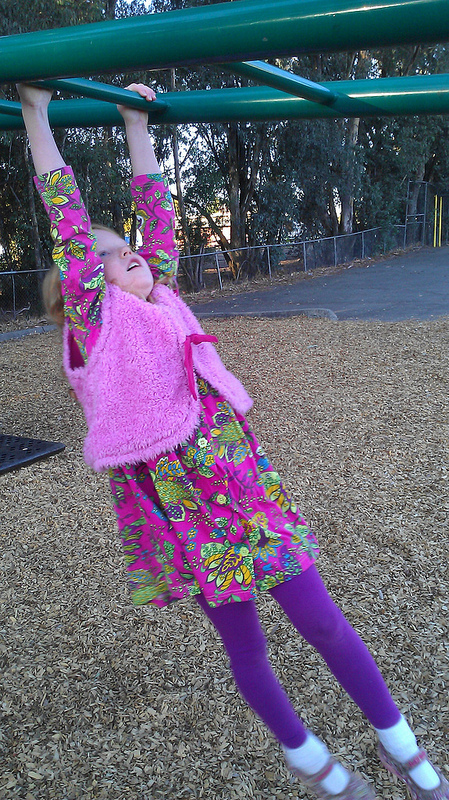 I take my normal standing place at the end of the monkey bars and watch her face. The look of determination was fierce. I was silently beaming with pride. When this girl wants something, she will get it. Then she took off. It was slow and deliberate. One hand then the next. Her face was filled with concentration. She made it past the halfway part and I had to bite my tongue to not scream out with happiness for her. She kept going. Slow and deliberate. One hand over the next. Finally she made it to the last bar and dropped. I did. I cheered for this accomplishment and for all those that will come her way. Look out world. This entry was tagged Determination, Family, Love, Monkey bars, motherhood, Pippi Longstocking, Pride. Bookmark the permalink.